When Supergirl last left us, National City had just been visited by Barry Allen, a hero from another network universe. The Flash and Supergirl are the most optimistic of today’s superhero adaptations, so it was a terrific crossover. But the last episode also left us with a big question, and it wasn’t that Pied Piper–esque cliffhanger. After a show says good-bye to such a charmingly complimentary guest star, will everything suddenly feel a little flatter? “Myriad” handily avoids that problem by propelling us into a full-on disaster — a massive, world-threatening problem of the sort we hadn’t yet seen on the show. As the end of “World’s Finest” suggested, all of National City is under the control of Myriad, and therefore Non. And that includes the DEO. The two have a brief, exciting brawl during which Kara pulls off a dope leaping punch. I’d like a GIF of that, please. Although Kara takes Maxima out quickly enough (after being grossed out by her talk about how she tried to hook up with Superman) and manages to stop the prisoners, she still has to flee. Lucy and another agent come after her with Kryptonite guns, forcing her to subdue them and head to the only place where she might find out what’s going on: the Fortress of Solitude. Unfortunately, Superman is off-world and Kal-Ex, the helper robot, isn’t very helpful — he’s not authorized to say anything about Myriad. However, an AI designed to look like her mother (like the one in the DEO, only strangely more lifelike) gives Kara an answer: It’s a mind-control program created by Astra, meant to pretty much force the people of Krypton to agree with her about the ecological disaster facing their planet. Which, honestly, seems a bit extreme. Also extreme? There isn’t a known way to counter Myriad. For now, at least it’s still confined to National City. At CatCo, Supergirl finds everyone is a drone, except Cat Grant, strangely enough. She arrives just in time to see Kara get a text from Superman, saying he’s on his way — and we actually see a tiny CGI Superman swooping in! Before he arrives at CatCo, though, he lands on the street and joins the mind-controlled horde. Cat and Supergirl are shocked, until one more free mind shows up: Max Lord. According to him, Superman fell victim to Myriad by living on Earth his entire life. His brain is more like a human’s because he was essentially raised as one from infancy. Max is free because he developed a dampener, since Non is using his satellites to broadcast Myriad. Cat is safe because he hid dampeners in a pair of earrings he sent her as a gift. He then says there’s only one way to save National City, and it’s by killing all of the Kryptonians with a Kryptonite bomb he devised. There’s a big catch, though: This bomb will also kill 8 percent of the city’s population. And herein lies the bulk of the episode: Kara is faced with a huge threat, which threatens to engulf the entire world, and the only solution is a really ugly decision that stands against everything she’s learned. There’s a lot to love about this. 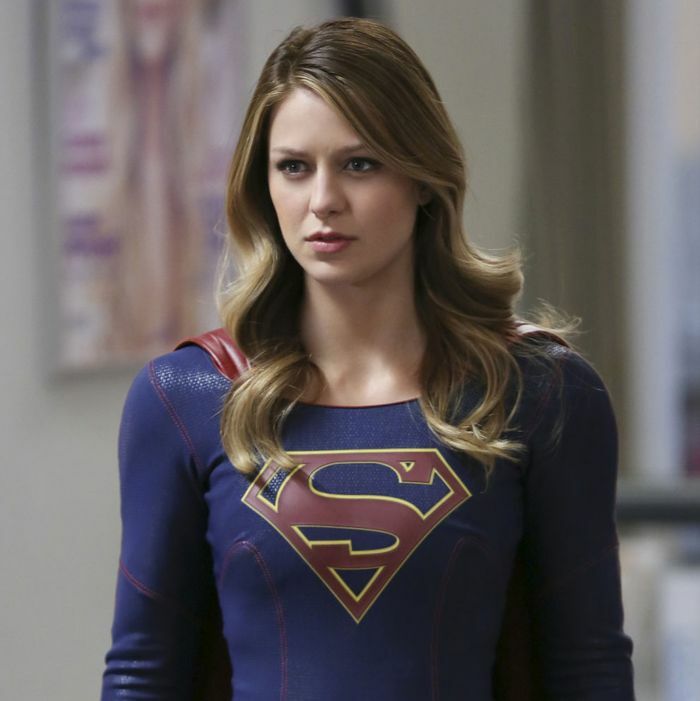 Supergirl, like Superman, is easily criticized for being too powerful to be interesting. When nothing shy of Kryptonite can hurt them, where’s the drama? However, that argument misses the point. Superhero fights don’t really matter all that much. The nature of the medium requires a hero to always win, eventually. What makes these stories worthwhile is giving a character something to fight for, a set of values at risk of being compromised. That’s how you challenge Supergirl or Superman: You give them an impossible situation, one in which it seems like they can’t save everyone. You dare them to try. They can’t be hurt, but other people can. This is something Non wants to illustrate by making Winn, James, and a nameless CatCo employee leap off the building to their deaths: Supergirl is only able to save her two friends. That failure nearly breaks her, to the point where she’s ready to go along with Max Lord’s plan. And that’s when Cat Grant talks some sense into her. Cat tells Supergirl that she knows she’s scared, but so are Max Lord and Non. They’re letting fear control them, and Kara is about to succumb to that same mistake. But there’s another way to be strong: not by doing horrible things that seem necessary, but by having faith in people. She needs to hold onto hope, because hope is stronger than fear. Some people might be tired of these scenes, but I’ll never get sick of them. Supergirl and Superman are relatable and relevant because their struggles are simple. They represent the better angels of our nature, the fight against our selfish instincts that don’t improve the lives of others. As people, we all have the ability to help someone else, but it can be hard. It isn’t quite natural. Supergirl reminds us it can be done, and in more significant ways than we might realize. Reaching out to others is everyone’s superpower. That’s what Cat Grant is telling Kara, and that’s why Supergirl — as messy and cheesy and unsteady as it can be — seems ready to end its first season on a pitch-perfect note. It’s also why it might break your heart. After coming back to National City to help, Alex falls prey to Myriad and winds up under Non’s control. She’s geared up in Kryptonite battle armor, wielding the sword she used to kill Astra, forced to fight her sister to the death. See you next week for the season finale. Even now, Cat Grant kills. Tonight’s best line, delivered as she walks into CatCo not yet aware of what’s happened. “Call Harrison Ford and tell him, once and for all, I don’t date older men.” GET IT? IT’S META. Hank and Alex on the road. The journey to find Cadmus is cut short (and probably saved for a season two, if we get one) as Hank and Alex hide out at the Danvers farm with Alex and Kara’s mom, who geeks out when she finds out Hank is a Martian. The pair of them decide to go back to National City to help Kara once they find out she’s there with no one but Max Lord by her side. Hank, however, is incapacitated by Indigo, which leaves Alex vulnerable to Myriad and Non. Shout out to the villains. “Myriad” presents its villains in a really smart way. Except for Indigo (who might prove to be the actual endgame next week), none of them are out-and-out evil. Max Lord gets his backstory fleshed out, as we learn he’s motivated by the fact that no one listened to him when he could’ve prevented his parents’ deaths. That’s why he won’t wait for anyone’s permission to save people again, even if the means are horrible. Meanwhile, Non is just trying to save Earth the way Astra meant to save Krypton. Even though the plan is horrible, he’s content to stop his conquest at Earth alone, even as Indigo urges him to overtake the galaxy. Also, he’s reluctant to kill Kara. He says he just wants her to suffer — and the Danvers death match supports this — but there’s certainly a chance he could be redeemed.